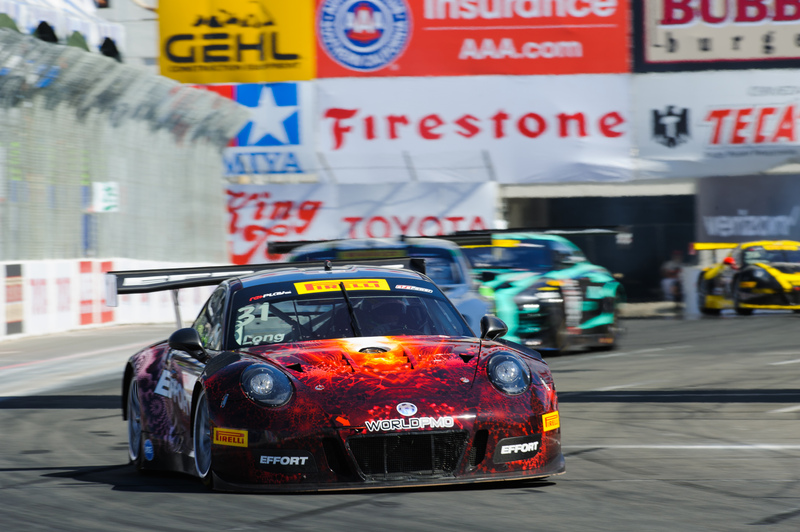 Sunday at the Long Beach Grand Prix, EFFORT Racing earned their 4th podium of the year in Round 5 of the Pirelli World Challenge. Porsche Works driver Patrick Long finished 3rd, picking up his 2nd podium of the season after winning Round 1 at Circuit of the Americas in the No. 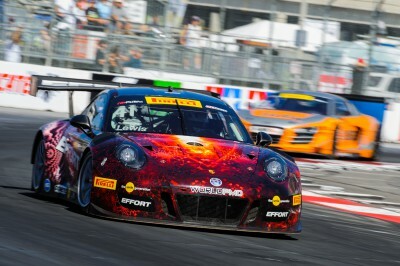 31 Porsche 911 GT3 R. Co-driver Michael Lewis brought home another top-10 position, finishing 6th. Following Sunday’s podium finish, Long unofficially moves to 2nd in the GT Driver Championship. Long started Round 5 in 4th position, directly behind the No. 3 Cadillac of Johnny O’Connell in 2nd. As the field went to green, O’Connell and Long got a run down the front straight on the two K-PAX Racing McLarens of Colin Thompson in 3rd and Alvaro Parente in 1st. Long passed Thompson to take 3rd position, then O’Connell to take 2nd in the opening lap. Lewis and the No. 41 Porsche 911 GT3 R started in 6th but shuffled back to 8th position in the before a caution came out in lap two. On the restart, O’Connell inched back to 2nd position, moving Long to 3rd, as Lewis worked his way up a position to 8th. The second caution of the race came out, and as the field went back to green with 20 minutes remaining, the EFFORT Racing drivers both continued to push forward. Long easily pulled away from 4th position, and the rest of the field stretched out, minimizing the potential for late race passes. Long finished 3rd, and Lewis 6th, both California drivers bringing home clean finishes in front of their home crowds. 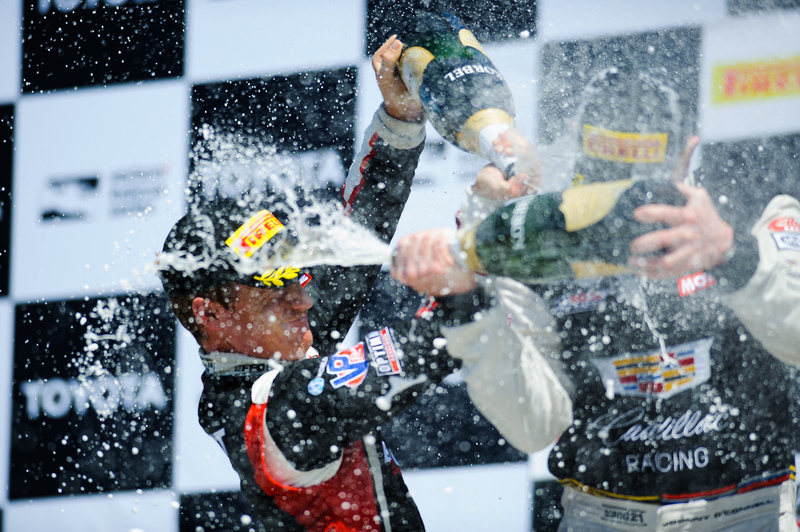 In just a few days, the team will arrive at Barber Motorsports Park for Rounds 6 and 7 of the championship. The double header event brought the team a podium finish in 2015, and with the driver and team championship battles, every effort will be made to earn strong finishes and gain valuable points. The first test sessions begin Thursday, April 21st. Watch the races live at motortrendondemand.com. For more information, visit world-challenge.com. Third place was a strong result for what we had today. Today we hit our full potential. We had a really good start, and on the first restart, I went for the lead and wasn’t left any room at the exit. Unfortunately, we slipped back to third and just had to settle in and get into a groove. It was pretty treacherous there at the end with fluid on the track. I was relieved to hold on the podium and get the season back on track. I started 6th and finished 6th. That’s a solid day, and I survived that race. I brought the car home clean, and the Porsche 911 GT3 R was fast over the long run. There were a lot of restarts out there, and it was pretty chaotic. I was just trying to be smooth and just keep my track position and keep the car clean. I fell back a little bit but then bounced back in the chaos. Congratulations to my teammate Patrick Long for him getting a podium at his home race. We have two clean cars going into Barber Motorsports Park and we picked up more points.